The Flight of the Phoenix was a 1965 movie starring James Stewart, and featured the story of how after a transport aircraft crashes in the middle of the Sahara desert, the pilot (Stewart) and surviving passengers and crew built an aircraft out of the wreckage and used it to return to civilization. During the filming of the movie, movie stunt pilot Paul Mantz was killed in a crash on July 8, 1965. The fatal flight was being filmed, and part of the footage that day did end up in the movie. 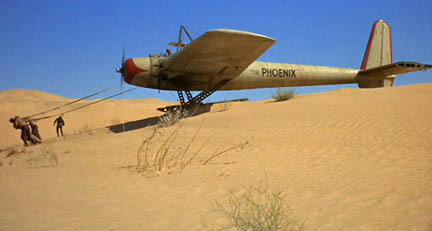 The aircraft was custom designed for the movie Tallmantz Aviation. It was a flyable model that was used for some of the scenes for the movie.